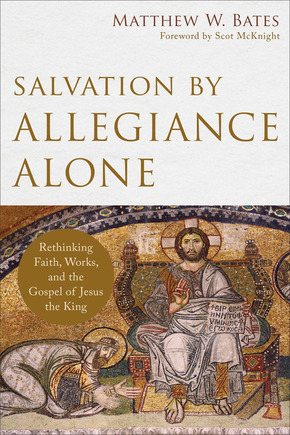 Bates, Matthew W. Salvation by Allegiance Alone. Grand Rapids: Baker Academic, 2017, 234 pages, $24.99, paper. The author of what the back cover proclaims is a “bold, provocative book” has the Ph.D. from the University of Notre Dame and is an assistant professor of theology at Quincy University, a Catholic institution. Bates is a Protestant who studied at Whitworth University and Regent College, Vancouver. He claims a broad denominational background and believes that this enables him to approach the issues in a fair way, going so far as to hope his work contributes to greater rapprochement between Catholics and Protestants. Scot McKnight writes the Forward to the book. Of course, what has traditionally separated Protestants and Catholics on the issue of “salvation by grace through faith” centers on what happens when someone believes or has faith. Simplistically, is that one “declared” righteous, or “made” righteous? What role do “works” have in this transaction—for one side or the other? But especially crucial for Bates’ concern, what is the nature of the “faith” that saves? And that question brings up Bates’ provocative assertion: “… ‘faith’ and ‘belief,’ insofar as they serve as overarching terms to describe what brings about eternal salvation, should be excised from Christian discourse. That is, English-speaking leaders should entirely cease to speak of ‘salvation by faith’ or of ‘faith in Jesus’ or ‘believing in Christ’ when summarizing Christian salvation” (p. 3). Provocative indeed! That raises crucial questions: how does the Bible define πίστις (pistis; usually translated “faith” or “belief”) and its related terms; and what is the nature of the “gospel” (good news) that one must “believe” to secure salvation? Since, according to Bates, “belief” or “faith,” or even “trust” are capable of such a bewildering (and fuzzy) array of definitions and uses among would-be evangelists, he argues it’s far better to employ a term that more adequately conveys what it really takes for a person to enter the Kingdom of God. The bulk of the book then proceeds to defend the view that “allegiance” far better expresses the New Testament view of what enables a person to apprehend salvation. In short, nothing less than allegiance or loyalty to Christ as King will secure salvation. After showing what faith is not (an extremely important chapter), the author engages in several chapters to elaborate what constitutes the “gospel” that one must embrace to be saved—employing both Jesus and the Evangelists in the four Gospels, as well as the writings of Acts and Paul. The “gospel” must not be equated simply with “justification” but is much broader. As Bates sees things, the “gospel” as outlined in the New Testament includes all the following elements and no explanation of the gospel is complete without all of these: Jesus the King (1) preexisted with the Father; (2) took on human flesh, fulfilling God’s promises to David; (3) died for sins in accordance with the Scriptures; (4) was buried; (5) was raised on the third day in accordance with the Scriptures; (6) appeared to many; (7) is seated at the right hand of God as Lord; and (8) will come again as judge. Then Bates shows that pistis (when used as the requirement for salvation) means allegiance, drawing upon the evidence in the New Testament as well as contemporary extra-biblical sources. He concludes that “the gospel is purposed toward bringing about the practical obedience characteristic of allegiance to a king—what I have termed enacted allegiance” (86; his italics). It’s important to add here that he does not argue that “allegiance” best captures the sense of pistis in all its uses—only when the acquisition of salvation is at stake. When Bates synthesizes the biblical data, he arrives at this definition: “saving allegiance includes three basic dimensions: mental affirmation that the gospel [the eight points in the prior paragraph] is true, professed fealty to Jesus alone as the cosmic Lord, and enacted loyalty through obedience to Jesus as the king” (p. 92). No kind of disembodied “faith” will save a person (e.g., only mental assent or a vague trust in Jesus who died for our sins), one must “do” or “act” for faith to be genuine and truly salvific. The Bible emphasizes a believer’s obedience, not merely one’s intellectual or psychological state of “believing.” In support Bates points to the need for the “obedience of πίστις” (Rom 1:5; 16:26; cf. 15:18-19), and Jesus’ words that “only the one who does the will of my Father” will enter the kingdom of heaven (Matt 7:21-23). Don’t mistake what Bates says here to mean that our works or our righteousness is what saves. As will be clear below, he asserts that believers are saved by virtue of Christ’s righteousness which becomes our through our union or incorporation with him. I think Bates might be hard-pressed to demonstrate that all uses of pistis when employed as the requirement for salvation mean allegiance. For example, when asked by the Philippian jailor, “What must I do to be saved?” Paul’s and Silas’ answer was, “Believe [a form of the cognate verb pisteuō] on the Lord Jesus, and you will be saved” (Acts 16:31; NRSV). From this short narrative it would be difficult to prove that the apostles then explained to the jailor (and his household) all eight components of the gospel and then summoned them to allegiance. More likely in that context the jailor was urged to place his “trust” in Jesus. Nevertheless, Bates’ extended analyses convincingly show that in those places where one may tease out the implications of the uses of pistis and pisteuō, allegiance seems to be the likely meaning. Bates anticipates that his proposal that salvation is by allegiance alone will engender a variety of objections, so he seeks to respond to various questions. For example, “If salvation is by grace (a gift), then how can it depend on allegiance to Jesus?” (p. 102). [As an aside, on the question of the nature of “grace,” Bates cites affirmingly John Barclay’s recent book, Paul and the Gift (Eerdmans, 2015). Barclay overturns some of the standard and simplistic understandings of the nature of grace. I highly recommend a careful reading of this book.] And Bates asks another controversial question: Can salvation be “lost”? Well, if allegiance is required for salvation, then, Bates concludes, one’s failure to continue to demonstrate loyalty to Jesus will result in the forfeiture of salvation. One can’t “lose” salvation, but one may jettison it. Since allegiance to the King’s agenda is what salvation entails, then, Bates argues, embodied loyalty leads to the vocation that each believer embraces: the transformation of this world. The hope of the Christian is not to go to heaven when one dies (note echoes of N.T. Wright here), but to join in God’s grand narrative of salvation (my language) culminating in the resurrection and the renewal of all things in the new creation. Allegiance gives meaning to one’s life now as well as a glorious hope in the future. As to the nature of “justification,” Bates addresses the issue that has historically divided Protestants and Catholics since the Reformation. Many Protestants espouse a kind of “imputed” righteousness while Catholics favor an “imparted” or “infused” righteousness. Seeking a better way, Bates locates an individual’s justification in his or her participation with or incorporation into Christ in the church. God vindicated (justified) Christ by raising him from the dead. Christians are then justified when they are incorporated into him. He questions whether the New Testament ever teaches that Christ’s righteousness is imputed to individuals. Works are the necessary component of saving faith, not merely the inevitable results of justification, which Protestants often relegate to sanctification as a separate and subsequent step in the ordo salutis (order of salvation). [On that point, Bates questions the validity of the ordo salutis so prominent in many Reformed formulations, claiming it owes more to systematic rather than biblical theology.] Nevertheless, he backs away from the Catholics’ idea of infused righteousness, preferring, as I have just indicated, what he calls incorporated righteousness. Again, embodied allegiance is a requirement for salvation, not merely a result. In keeping with the incorporation model of righteousness, then, Bates decidedly minimizes individual election to salvation and points to the Bible’s emphasis on the corporate nature of election. He points out “… the election story the Bible wants to tell: God’s election of the Messiah through Israel’s election in order to save Jew and gentile alike within his elect church” (p. 171). People are saved by their incorporation into Christ’s elect body, the church. The requirement for entrance into this body is a pledge of allegiance to their Lord (King). The book ends with a chapter entitled “Practicing Allegiance.” In it Bates offers a suggestion about a better way to invite people to salvation—to do evangelism. Unless people come to embrace the actual gospel (again, recall the eight points above), they can’t be saved. He goes so far as to say, “We must stop asking others to invite Jesus into their hearts and start asking them to swear allegiance to Jesus the king” (199). He insists that we dare not give people “assurance” of salvation on the basis of their acceptance of a gospel invitation, but base it on the evidence of their loyalty to Jesus. Good works growing out of allegiance to Jesus secure genuine salvation; it is not secured by praying a prayer to “accept Christ” whether or not a person ever does good works. At this point readers of this review will readily see why some of Bates’ conclusions will cause considerable dis-ease among many descendants of the Reformation, particularly those of a Calvinist orientation. While Bates does not reject, e.g., the rallying cry “Sola Fide,” he certainly challenges what fide (faith) has traditionally meant for them. That is, for Bates only one who lives a life in allegiance to the King possesses eternal salvation. While many might argue that genuine salvation leads to or results in good works (again separating justification and sanctification), Bates rejects that bifurcation. Only a “working faith” saves. Readers will see a strong correlation to the appeal in James’ letter, and why Luther was so unhappy with James’ formulation in contrast to Paul’s. This is precisely Bates’ point: James had it right all along, and we should understand him to mean precisely what he said! We must cease defining saving faith in any ways that strip works from its very essence. To put it starkly, one must work to be saved, and if one finds that statement heretical, Bates would ask readers to review the evidence in the NT that doers of the word will be saved, and that judgment will be based on what one does (cf. Rom 2:6-7, 13; Rev 20:12-13). Bates also sides with a growing minority of scholars who find in the Bible an emphasis on the corporate nature of election and salvation—again in contrast to the Reformation’s descendants who stress particular or individual election to salvation. I think this is one of the strengths of the book, though it’s not a major point to be sure. Likewise, I applaud his emphasis on the overarching scope of salvation that puts an important emphasis on believers’ efforts to effect God’s agenda for the transformation of all things in Christ—both now and in the eschaton. Allegiance to Christ matters now in bringing in the kingdom of God. That’s the point of salvation (and hence the requirement of allegiance), not merely so that we can go to heaven when we die. This is a crucial message for Christians and the church today: as loyal citizens of the Kingdom of God we have a calling to promote Christ’s agenda in the world. We see why good works are important and of the very essence of God’s salvation. Of course, Bates is not alone, nor is he the first to point out the anemic results of views of “faith” that may give people assurance of salvation (particularly when coupled with a view of “once saved always saved”) but which produce little evidence of changed lives. Dietrich Bonhoeffer famously wrote about “cheap grace” in his Cost of Discipleship. But the value of Bates’ book lies in the ground-breaking work of helping us see that we have misconstrued the nature of the πίστις required for salvation (as Barclay helps us see that we may also have misconstrued “grace”). Instead of insisting that people count the cost before they sign on as Jesus’ disciples (as Jesus did, e.g., Luke 14:26-35; 18:17-25), in our eagerness to make converts we may be too prone to present an inadequate (and perhaps vacuous) way to enter the kingdom. We lower the bar of entry because we fail to grasp that Jesus requires allegiance. The sober implications may well be that many people who think they are saved might turn out not to be, and may find themselves among those Jesus identifies at the end of his Sermon on the Mount: “Not everyone who says to me, ‘Lord, Lord,’ will enter the kingdom of heaven, but only the one who does the will of my Father who is in heaven” (Matt 7:21; NIV). May we by our actions show our loyalty to King Jesus, and may we be eager to invite others to swear their allegiance to him as well.